FOR WHEN THE TILLING GETS TOUGH! The Bourgault 9400 Chisel Plow is designed to require less maintenance than any other chisel plow in the industry. Three-Point Hitch-to-Frame Attachment - Bourgault chisel plows are designed with a hitch that can take all the power needed for the toughest jobs. Low Maintenance - The 9400 Chisel Plow will provide many seasons of trouble free service. Excellent Contour Depth - The 9400 design ensures even opener depth through the frame. Handle Maximum Residue - Bourgault chisel plows are legendary for residule clearance. Bourgault Spring Trip Assembly - Proven over the decades as the standard in trip design. 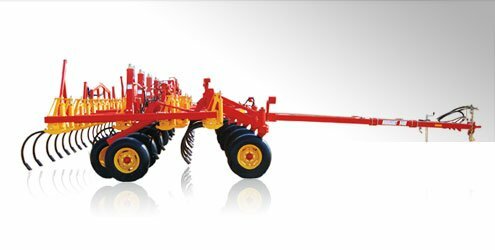 Dependable Hydraulics - Bourgault incorporates a superiour hydraulic design. Single Point Depth Control - Quick and effective depth setting. Side Draft Eliminators - Eliminate skewing in hilly field conditions. Spring Action Mud Scrapers - Keep your wheels clean in wet conditions. Titan Quik-Detach Arms - Mounted harrows and packers can be interchanged quickly and easily. Mounted Harrows & Mounted Packers - Bourgault chisel plows are available with a number of mounted attachments to match your requirements. Bourgault Trailing Hitch - The Bourgault 9400 Chisel Plow is designed for towed implements such as fertilizer caddys or anhydrous carts.